A Trust Fund will be inaugurated today at the Girihanduseya Premises to develop the infrastructure of the Great Stupa Girihanduseya. Royal Patronage is given to this event. Most Venerable Agga Maha Panditha Kotugoda Dhammawasa Anunayaka Thera, President of Sri Lanka Amarapura Maha Sangha Sabha Assembly Ven Tirikunamale Ananda Anunayake Thera Chief Incumbent of Nithupathane Girihanduseya Stupa Shastrapati Ven Devinuwara Chandima Thera, ministers and former Minister Milinda Moragoda will participate in this ceremony. Girihanduseya Stupa in Tiriyayagama in Kaddakulam Pattu, netting in a mountain top in Neethupathpana in the Trincomalee District, is supposed to be the first Buddhist stupa and shrine, constructed in Sri Lanka as well as in the world. Therefore, for Buddhists, and the general public this site is very significant and important. 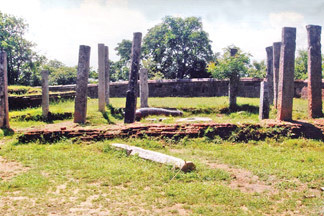 According to Mahavamsa, the Great chronicle, Thuparama Dagaba or stupa, was built after the official introduction of Buddhism to Sri Lanka during Devanampiyatissa Era. The ancient historical stupa, presently known as Girihanduseya is vital to Buddhists as inside this stupa, Buddha’s Hair Relics were enshrined. During the week-end, my wife and I, visited this great religious site. It was a pleasant drive all the way. Through Habarana, Junction, we drove to Trincomalee our first stop. We were passing through villages, one after the other, each vibrant with life and excitement, now, due to the development projects and programmes under taken by the Government. There is a big flow of Tourists to this area and now it is a hub of busy activities. The story woven round Girihanduseya is amazing. It is believed, the Buddha after the 50th day of gaining the Sammasambuddhatvaya, Enlightenment, the Bliss of Nibbana, accepted alms from two Indian traders – Tapassu and Bhalluka, two North Indian traders who lived in a city of Pushkaravat. They offered (Vilanda kenda mixed with honey) a porridge to the blessed one. Buddha accepted the alms. After partaking the meal, the two traders, requested the Awakened one, to present them with some sort of a souvenir to remember the Blessed One. The Buddha very kindly offered the two dayakas or lay disciples a lock of hair from his head to them. The great country India, from time immemorial, maintained very cordial and friendly relationships in the ancient times, and still they continue uninterrupted. India and Sri Lanka had close ties diplomatically on matters of politics, economy, culture, religion and specially Trade. Tracing the ancient history of Sri Lanka, the beginning of the Sinhala Nation began with the arrival of Prince Vijaya from India. Buddha himself visited this island thrice to Mahiyangana, Nagadipa and Kelaniya respectively. According to reports the Enlightened One settled disputes and wars. Through diplomatic relations the two countries – India and Sri Lanka maintained Trade as a source of income to both countries. Sri Lanka, possessed many natural resources such as gems, diamonds. Probably the Indian traders have frequently visited Sri Lanka. The East and Northern part of Sri Lanka was considered as the “Rice-Bowl of Asia.” Many Indian Traders would have exchanged their goods, according to the “Barter System”. Therefore, we can truly behave, the visit of the two Indian Traders during the period of Buddha to the present Trincomalee District, for Trade Exchanges. According to the great pious monk, an authority on Archeology – Ven Ellawela Medananda Thera MP, believes, these two traders, Tapassu and Bhalluka may have arrived through a ship from India by sea, and must taken the route through a place called Galwaraya and arrived in Trincomalee district. The historical facts woven round Girihauduseya is like a fairy tail. According to the verses written in Sanskrit – the Rock Edicts found around this premises reveals that Tapassu and Bhalluka – the two traders were responsible in constructing this cheitiya, namely Girikanda Chaitya. Giri means Rock mountain. Even today, people around Nitupathpana believe that this Girihanduseya is guarded by many gods and Avalokitesvara and Manjusri Bodisatvas – or aspirant Buddhas. There is an amazing story behind Girihanduseya Cheitya. The two traders Tapassu and Balluka, who were blessed to receive the “Hair locks of Buddha – Keshadatu, for safety, they hid the Hair Relics in a place in the mountain Girikanda. After they finished their Trade Mission, in Nittupathpana Trincomalee District, they want to take with them their most valuable precious souvenir the Hair Relics home. Behold! What has happened. The bowl where the Hair-Relics were kept could not be removed from the place as it was stuck to the rock. The two traders after they completed their mission, tried him to remove the Hair Relics, but they were not successful. Ultimately, they discussed with the villagers and decided to construct a stupa, covering the valuable “Saririkadhatu” - relics collected from the body of the Buddha. Thus the first Buddhist stupa was constructed in Sri Lanka. Incidentally this was the first Buddhist Dagaba constructed in the world too. 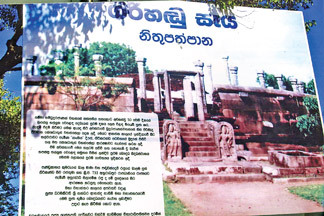 According to historical resources, the king Girikanda and King Aggabodhi Sheilamagha, who ruled Anuradhapura in 733 BC was in charge of the Nithupathpana area in Trincomalee district. Presently the personnel of the Defence’ Forces actively participate in all religious ceremonies connected with Girihandu seya. It should be mentioned here, religious shrines, churches and kovils experienced some sorts of unnatural, unbelievable phenomena and miracles. I presume, this may be due to veneration of thousand of devotees to these holy places. Of course, scientifically you are unable to prove it. But miracles do happen, I believe. There was an interesting story woven round a pregnant mother. Out of the joy emanated from extreme devotion and respect to Buddha (Buddha Lambana Preethiya) how she worshiped the Girihanduseya. This story is found in Buddhagosha’s Visuddhimagga. A certain young pregnant woman requested her parents to take her to witness a festival of lights at the Girihanduseya stupa. As her condition was very delicate, the parents advised her to witness the glamour from the foot of the mountain as it is a risk to climb the stupa. The parents left she was witnessing the festival of lights with extreme devotion. Suddenly in few minutes he was alighted to the mountain top by some divine power. When the parents saw her in the compound of Girihanduseya stupa, they were amazed. It was truly a miracle. Due to foreign invasions, the people and the monk, drifted to safe places and Girihanduseya stupa lost its prestine glory as it was covered by a jungle. It was due to the great effort and sacrifice made by the Maha Sangha – Buddhist monk and specially late Venerable Dharmakeerthisri Gandara Ananda Nayake Thera Chief Incumbent of Neethupatapane Girihanduseya, today the Sri Lnakan Buddhists were fortunate to worship the most sacred Hair Relics of the Buddha. Presently the chief priest, incumbent Ven Dr. Devinuwara Chandima, scholarly monk, of Girihanduseya, following the footsteps of his illustrious teacher Gandara Ananda Thera is taking all possible steps and measures to improve the infrastructure of Girihanduseya stupa. It should be remembered for the part thirty two years, the devoted great Buddhist monks and villagers of Nithupathpana under many difficult trying conditions taking a life risk guarded Girihanduseya, where the blessed one’s Hair Relics were enshrined. Probably the unseen gods guarded the Hair Relics of the Buddha and Avaloketeshvara and Manjushri.